Wearable technology is a powerful new tool, and the sheer variety of functions it can serve is perhaps the most amazing part of all. For wearable technology, fitness tracking is one of the biggest functions served, and so there are a variety of tools, and form factors, to help people track their workouts. 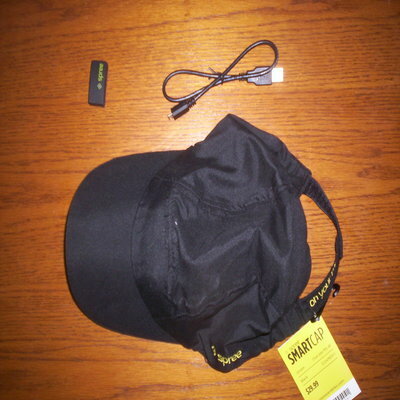 The folks at Spree Wearables recently sent me a Spree Smartcap for review. The Spree Smartcap is comprised of three parts: a small wearable module with a USB cable, and a cap that's geared toward containing the device and keeping it in place on the user's forehead. A plastic recess on the cap holds the unit in place. Also, an app accompanying the Spree Smartcap—which itself requires some fairly recent hardware to use—completes the package and allows the user to track fitness according to a string of goals. On the up side, the app works quite well, and offers an array of options in terms of tracking fitness for the sake of goals. It's also compatible with a variety of other apps, from Runkeeper to Map My Fitness and beyond, and that helps in terms of sheer versatility. With so many options on hand, making it work in individual circumstances should be comparatively simple; I took the opportunity to set up a few goals, focusing on duration and distance, though there are some steps involved; if you're not regularly updating your system, or you don't normally keep your Bluetooth on, these are points that might trip you up. They didn't get much in the way for me, but it would be easy to see that as a problem. Once you've set up the system, you'll then need to set up some basic information about yourself, more specifically, things like name, height, weight, age and gender, which will be necessary to calculate results correctly. That's important, naturally, and it really helps that this is so dedicated to getting accurate results. Once faced with the number of options available—running and cycling were largely out of the picture thanks to the conditions on my favorite walking track, a poorly-traveled road alongside my house, and I wasn't going to get a gym membership just to take advantage of the gym setting—walking became the best fit for the situation. From there, a set of rollers on the screen allowed for alteration of individual goals—just slide the controls in the appropriate direction to make numbers larger or smaller as desired—and progress toward those goals set is easily seen. It wasn't really difficult to work with, but I was thankful all the same that Spree has a video tutorial showing exactly how to work the system so that any questions I might have had would be answered readily. The goals did seem to line up well; goals based on distance—easy to measure thanks to my straight-line walking track that regularly features car traffic, including my own—did seem to match up; what it claimed I walked seemed to match up to what I actually walked as measured with the car's odometer, which is a good thing, as inaccurate measures here would be a particular problem. But while the system itself works on several levels, it also has some problems. Immediately upon putting the thing on my head, I knew something was up. I could barely get the cap over my head, and that left it sitting very shallowly on my skull. A sufficiently powerful gust of wind might well have sent this thing flying clean off my head, and I wasn't in a mood to see just how impact-resistant the base unit was. I give them due credit for including a velcro strap in the back, and I make no bones about the fact that I'm not exactly a normal-sized person—you stand 6'6 and weigh in around 300, you get used to “this doesn't fit” as a way of life—but it's just never good practice to call it “one size fits all” unless it actually does. Another con is that the Spree system requires some high-end technology to serve as its base. The system requirements start with iOS 7 or Android 4.4.2 to open, with some significant devices required to run the system, starting with an iPhone 4S at minimum. Add on a healthy price tag just for the Spree Smartcap itself at $199—buying through Spree, however, gives buyers a free one year subscription to Triathlete Magazine, which amounts to a $34.95 value—and it's going to be a pretty high barrier to entry for many users out there. My final take: Those who already have an up-to-date smartphone, tablet or the like will lose a good chunk of this expense off the top, which is a good thing, and in turn get access to a good quality fitness tracking system that works on several different levels. It also helps if your head is not abnormally large, because any amount of strenuous exercise or high winds will probably take this ‘regular size’ cap right off your head. For those with big heads and thin wallets, this is probably not the fitness trainer you're after. Pros: Fairly easy to use. Great tutorial video to clear up any questions. Extremely versatile and works in a variety of different situations and settings.